Arthur began his career in the hardwood lumber industry in November 1958, at the age of 29. Mr. Schaller hired Art for an outside sales position with Gaines Hardwood Lumber Company. When Art was hired for this sales position he had not had any previous experience in the hardwood industry and had been making his career in the meat packing industry. 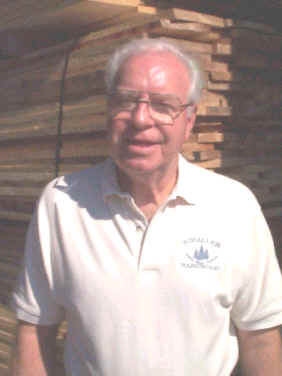 After achieving considerable success in hardwood sales with Gaines Hardwood Lumber Company, Mr. Schaller recruited Art for an outside sales position with his new company, Schaller Hardwood Lumber Company, in June 1961. In March 1962, Art became a minority stockholder in Schaller Hardwood Lumber Company and was appointed Treasurer of the company. In addition to his duties as treasurer of the company, Art continued working as a outside sales professional. Over the next approximately nine years Schaller Hardwood Lumber Company continued to grow, with Art becoming the leading sales professional. In January 1971 disaster struck Schaller Hardwood Lumber Company when a 5 alarm fire destroyed all the company’s hardwood lumber inventory and warehousing, with the only structure being saved the office building. The decision was made immediately to rebuild and continue forward. Art was given the responsibility of designing, permitting, and contracting to have the facility rebuilt. In addition to this responsibility Art had to continue to generate sales and procure new inventory to keep the company in operation. In April 1971, Art was appointed Vice-President of Schaller Hardwood Lumber Company. In addition to his responsibilities as Vice-President, Art continued to cover a sales territory and function as the sales manager of Schaller Hardwood. In May 1975 Art organized Schaller Hardwood’s first and only open house for all the company’s customers and suppliers to showcase the addition of a dry kiln, planner, and straight-line rip saw. Schaller Hardwood Lumber Company became the first hardwood distribution yard in the Midwest to operate its own drying facility. Prior to 1975, Schaller Hardwood Lumber had used outside millwork facilities to surface and rip all lumber orders. With the additions of the surfacer and straight-line rip saw, Schaller Hardwood Lumber was to able provide their customers a new level of service. In April 1979, Art was appointed President of Schaller Hardwood Lumber Company. By this time Art had relinquished his outside sales territory and had began supervising all outside sales personnel, handling procurement of all hardwood lumber inventory, and scheduling all truck deliveries. In September 1979, Art established Schaller Hardwood Lumber Company’s profit sharing plan. This plan since its inception has returned to the employees of Schaller Hardwood 15% of their gross compensation every year except one when the contribution was 10%. This is one of Art’s proudest accomplishments. Late in 1979 Schaller Hardwood Lumber Company was again faced with a pivotal decision. The company was being forced from their facilities in St. Louis due to hospital expansion and redevelopment. Art began the search for a suitable location for relocation and finally settled on Poplar Bluff, MO. In 1980 and 1981 Art oversaw the relocation of all warehouse facilities, dry kilns, millwork facilities and the general office to Poplar Bluff, MO. A small satellite office and warehouse was established in St. Louis. During this time of transition Schaller Hardwood was able to continue to service its customers with no interruption. The success of the move to Poplar Bluff, MO has far exceeded the expectations of Schaller Hardwood when the move was initiated. In October of 1983 Art was elected to the Board of Directors of the Hardwood Distributors Association of the National Hardwood Lumber Association. The Hardwood Distributors Association is a organization of hardwood distribution yards from all over the United States. In September of 1987 Art was elected President of the Hardwood Distributors Association. Art also was elected to the Board of Directors of the National Hardwood Lumber Association for a term of 6 years from 1985 to 1991. In March 1997 Art was appointed Chairman of the Board for Schaller Hardwood Lumber Company. Art handled all major plant expansions and capital expenditures. Under Art’s guidance and supervision Schaller Hardwood Lumber Company has grown into a company with locations in Poplar Bluff, St. Louis, Tulsa, Ok., Springdale, Ar. and Marionville, Mo. The total employment at Schaller Hardwood now exceeds 60 employees, the company operates 6 over-the-road tractors, has 6 dry kilns with a total 240,000 bf capacity, and has increased sales every year since the move to Poplar Bluff.